From the spooky Midnight Mysteries comes the anticipated sixth episode, Midnight Mysteries: Ghostwriting Collector's Edition. If you liked the previous five chapters, then you’ll love this one. The art is a little extra spooky, complete with a full moon, raven, and 3-d snow-dust looking stuff. The game starts with Charles Dickens reading a letter from Washington Irving, in which Irving expresses that he is in danger. 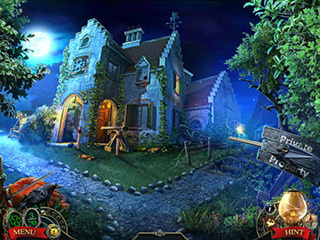 Meanwhile, a stranger outside is watching… Play the part of the great Charles Dickens in this historically-based hidden object puzzle adventure game that will have your wheels turning for hours! If you are a fan of 19th century British literature, then this is the game for you. You get to hunt down a weird-faced spirit who can disappear into a blur and fog of green smoke. There are lots of little literary references throughout to keep your eyes out for. For example, there’s a picture of Edgar Allan Poe on the wall by the staircase in the first room that you enter. The game is customizable to allow you to have the gameplay that meets your skill level and expectations. The mini-games are lots of fun. “Ghostwriting” has really got a double meaning here. The collector’s edition is especially worthwhile. There is the Shepherd’s Monument mystery in the bonus adventure that exceeds other bonuses. There are achievement rewards throughout that will have you searching for more more more! There are some amusing cutscenes that you’re sure to enjoy, and as always, there are various media downloads and a Strategy Guide to help you through your gameplay. Good art. Good story. Good minigames. Good game! 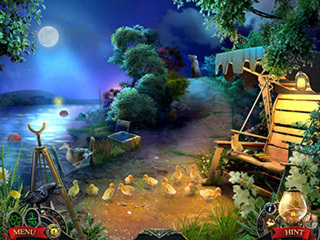 This is Midnight Mysteries: Ghostwriting review. Download this game here.